Hoppo Bumpo: Sew ... what are you? Sew ... what are you? When my machine went kaput last weekend, I joked to a few people that it "must have been the quilt". You see, since learning to sew I have focused on clothing. 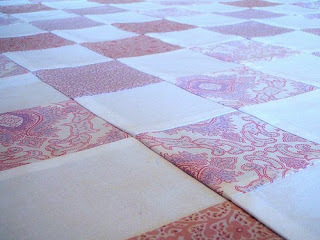 This quilt was a departure and patchwork was, as it were, quite unfamiliar territory. Was I paying for crossing to the dark side? Now, before anyone sets upon me with a rotary cutter and basting pins, I promise this was all said in jest. I have the greatest respect for quilters (despite their funny quarter inch feet). I really did mean dark side in the sense of craft-in-which-I-display-complete-and-utter-ineptitude. But it has got me to thinking. Is this craft I have been calling sewing a practical art in itself or an umbrella for some very distinct crafty subcultures? Quilters and embroiders and garment makers all use a needle and thread, but do quite different things. And one doesn't necessarily give you license in another. My embroidery is horrible and the quilt-top above bears all the hallmarks of some rather dodgy, slapdash practices. I like to think on the other-hand that I finish garments quite nicely. When I consulted the font-of-all-knowledge Wikipedia, I discovered that sewing is even used in taxidermy. I don't know about you, but despite my love of sewing I have never been the least bit interested in stuffing and mounting a vertebrate. So, do you sew? What are your thoughts? Do you consider yourself a sewist ... or as something more specific? I am always scared to tell people "I sew", lest they overestimate my ability! I think you should start a list of 'sewing subcultures' so we can all identify ourselves according to our interests and levels of ability. I probably need something along the lines of "does not understand dress patterns in the slightest, can very confidently sew anything in a straight line, no zips please, excellent at blanket stitch". Yes, a list please. But need the ability to tick a few boxes. I've usually just considered myself 'able' when it comes to sewing. And sometimes being 'cheap' has driven me to create things that I end up quite proud of. But a sewer I am (that sounds quite awful actually - surely there is a better word). Also an impatient quilter (definitely NOT a patchworker) and a purchaser of sewing books and fabric. I can't bring myself to plop into the category of general sewist because sewing clothes scare the bejesus out of me. I'm really not very capable. Can I squat in the quilter corner? Oh! I just read Gypsy's comment! I am a perfect fit for her subcategory! I do like Sally's answer! I think I would be what is commonly known as a 'dabbler'. A bit of dress-making, some lovely curtains, some dodgy curtains, a bit of embroidery, a bit of cross stitch... a bit of everything really. I have never sewn an animal (apart from the cuddly toy variety) and think they are a different category altogether. Not being a 'perfectionist' suits me fine. I don't know what I would call myself .. but usually it's "in desperate need of a distraction"
I sew, but almost exclusively clothes. I did dip my hand into purses for a quick fling, but don't enjoy it as much as clothing. I was amused by the taxidermy comment, and have to add that as a doctor, I also sew people. In fact, my hand sewing is better than it used to be courtesy of my suturing skills, and in medical school I picked up suturing quite quickly, for while the stitches and needles are different, the concept is the same. I consider my self a sewist of children's clothing. On occasion I make other things, like baby nursery items ( I have 5 grands and 2 more on the way), I have made (but didn't like doing it) curtains, etc... I used to sew for myself and later for my daughters (3 of them) and now mostly for mt grands, but for other children, too. I do other creative things to relieve my craziness, like draw, paint, write, and whatever else comes to mind that I want to try. Now, I didn't say that I am great at any of these crafts, but I like to play with them! As my aunt used to say all the time, "I am a jack of all trades, but a master of none." I'm a quilter. I have made (adult) clothes - hated it. and curtains - hate making those too. I like making kids clothes, but don't have much need for it these days. My pet peeve is this: when people find out that I quilt, they assume I will do any sort of sewing and start asking me to take up hems and fix zips and make petticoats (!) so now I am pretty clear that while I sew to make quilts, and I don't do any other kind of sewing. I could if I wanted to, but I don't want to. Hmmmm....I say I'm a 'crafter'.If I said I was a quilter, that wouldn't be a lie but it would be misleading too as I like to sew clothes and make things other than quilts. But saying I am purely a 'sewer' would also be misleading as I love crochet and knitting! I used to call myself a dressmaker, but now I put 'craftsperson' as the answer to the 'occupation' question on paperwork. I still mainly do textile work using a sewing machine, but I also hand embroider, much around with leatherwork, screenprint and hope to get into projects involving power tools in the next fortnight. As long as it doesn't involve a big financial outlay I'll give it a shot. I'm squatting in the quilter's corner with Sheridan. I can (and do) sew other things ... but I'm all about the quilts. Is there a corner for the novelty sewer ? Someone who doesn't sew anything actually useful? I am tending to use the term "maker" more than "crafter" these days, not sure why really.. This is quite fascinating Liesl, I'll keep coming back to see what other terms come up in this subculture...love it! I think I would call myself a sewer. I mostly sew garments, although I do throw in an occasional crafty item. There are times in which I try to make as much things (clothing, items to use, to decorate, to eat) as I can myself, but I have to admit defeat on that way too often, just because there isn't enough time. If I had the choice, I would think about, draw, design and sew mostly dresses all day long. That's what I love the most. I'll join Sheridan and Andi, I am a quilter, I can sew other stuff (and often do - clothes for the kids, the odd bag for me) but none of that gives me the same enjoyment as making a quilt does. Thanks for stopping by for a coffee!! We are a varied and interesting lot aren't we? I love couture - I dream about evening gowns and silk, design and pattern cutting, beads and lace - swathing the female form in beauty. Ahh! But I have great respect and admiration for all of you who produce amazing quilts, toys, jewellery, textiles, bags, millinery, embroidery etc. etc. etc. Wonderful artistry of all sorts! I think you've really hit on something here! If I ever tell someone I sew, I'm suddenly a master of all things sewn in their eyes! Clothing freaks me out, but I've done some hemming and repair work. My grandmother was a seamstress and I made beautiful things under her direction, but without her I'm too chicken. I took a beginners quilting class and made 12 different blocks. Take a class if you can... I learned a lot. I think quilting is actually easier than making clothing. I think in the overall I'm with Gypsy too... straight lines, no zips!